Celebrate with us the 10 years of JFL-Media! In discounts and promotions !!! 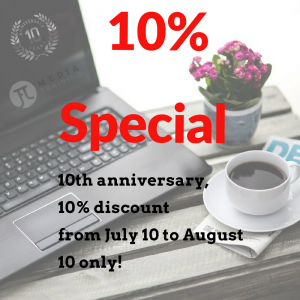 Take one or more training between July 10 and August 10, 2018 and receive 10% off. 10% off all courses offered by JFL-Media. Training must be taken between July 10 and August 10, 2018 without exception. Training must be booked and paid for when appointments are made. 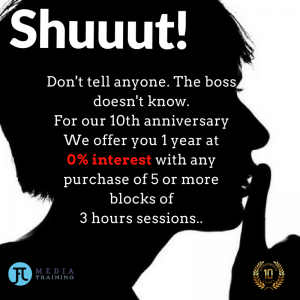 0% interest for 12 months ! Give a boost to your career! Register today for five or more sessions with a 0% financing for 12 months! This offer is not refundable once the classes begins. 3 hours of classes for a total of 15 hours or more of training time. You have 12 months from purchase date to take your classes. This offer is valid only between July 10 and August 10, 2018. For individuals only, in Canada. Contact us for more details about our promotions !